The Naples Daily News reported Joanne and Len Sadowsky were playing at the Bonita National Golf Club in a couples tournament Saturday when she had a bad tee off on hole 2. Joanne Sadowsky’s light pink ball ended up in the powerful jaws of the alligator at the Bonita National Golf Club. 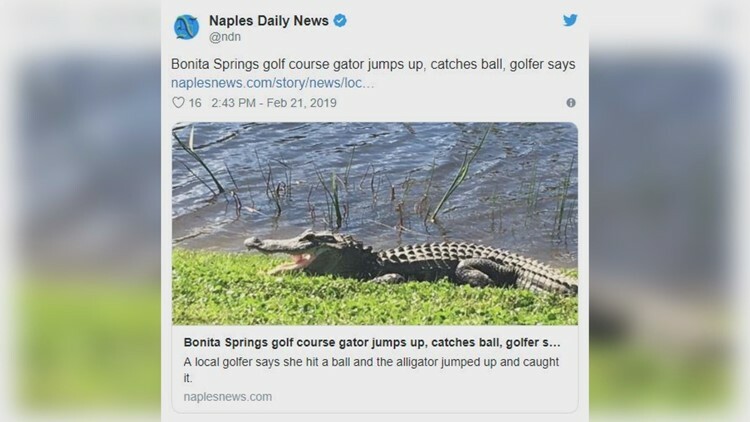 BONITA SPRINGS, Fla. — An alligator recently joined a golf game in Florida. The Naples Daily News reported Joanne and Len Sadowsky were playing in a couples tournament this past Saturday at the Bonita National Golf Club on the Corkscrew Swamp Sanctuary in Bonita Springs. Joanne reportedly had a bad tee off on hole 2. Her light pink ball found its way into the strong jaws of the gator, earning her a free drop, the newspaper said. “It saved me from a hazard penalty,” she explained. You can check out the incredible photo below.